Born and raised in Galway, Ireland, Luke has been a New York City resident for six years. 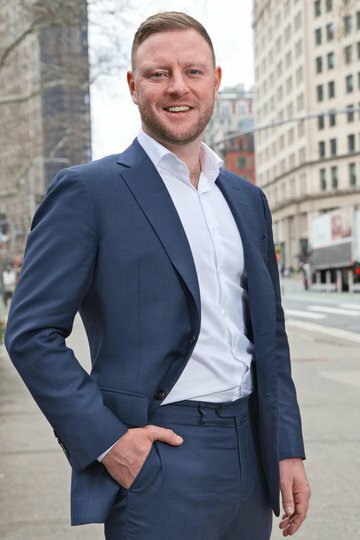 His life long passion for real estate came to fruition in 2018 when he made the transition after six years in the NYC hospitality industry. Luke prides himself on building lasting relationships with his clients and ensuring that the process of finding them their dream home is a smooth as possible. Luke holds a Bachelor of Business degree from the National University of Ireland, Galway and a Master’s degree in International Business from Nottingham Trent University, UK. Luke moved to New York after graduating from university and currently resides in Astoria, Queens. Luke is an avid traveler; he and his wife took a year to backpack across Asia, Australia and New Zealand in 2016. Additionally, Luke is the Brand Ambassador for Magner’s Irish Cider here in the US, a role he is very proud to hold. He is a golf fanatic, and enjoys photography in his spare time. He is also a huge foodie and has a food Instagram, @thehungrypaddy.